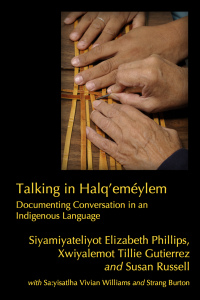 Talking in Halq’eméylem takes an innovative approach to recording indigenous languages, in that it uses Conversation Analysis to look at the structure of conversation. This conversation was recorded between two fluent speakers, and it is presented twice in this volume, once with CA notation and once with interlinear glosses. Also included is a prologue by Siyamiyateliyot Elizabeth Phillips in Halq’oméylem and a Forward by Marianne Ignace.